CYO Outdoor Ministry: What is the Nanamakee Geocaching Trip About? So you may have noticed the new Nanamakee Geocaching trip for this summer. We are excited to be offering this trip out of Hamilton to High School aged campers. Geocaching is a treasure hunt that involves hidden treasures that can only be found through clues and the use of a GPS unit. It is a great way to get outdoors and connect with millions of others who geocache around the world. The week will start at camp with a day of learning how to use the GPS units and searching for caches on the site. After that we hit the road to search for caches at local parks, and some very unlikely locations. We'll also make our own cache to hide and leave a travel bug that we will be able to track as it travels across the county. Check out the picture of Sarah Nasser. 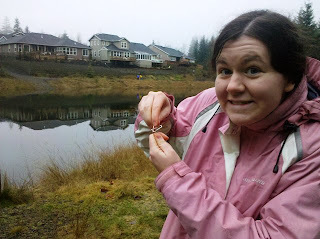 Sarah Humlie and I joined her for a very wet geocaching day in Duvall.